When I tell people about my burpee habit, their most common response is to suppose I was born with superhuman discipline. I do them daily, and have since December 21, 2011, starting with 10 per day. Now I do over 50 per day, in two sets, followed by stretching and other exercises to work what burpees don't. So when I write "burpees," I mean "10-minute burpee-based routine." Any self-imposed, daily, challenging, healthy activity would work--push ups, jumping jacks, etc. People associate them with hard work. I associate them with the opposite. I'll explain why after setting some context. As for my being born with extra discipline, it's the opposite, which is why I do them. I watched a lot of TV growing up. I ate a lot of junk food. I misbehaved in class. When I learned my life improved more by my improving it, I started moving toward fitness. I played sports when I was young, but at 45 years old, it's harder to find teams to play on. I still want to keep fit to improve my life. Not having a skill so valuable as discipline is a reason to do something that requires it, not to avoid it. I've come to see discipline as a skill that creates others. 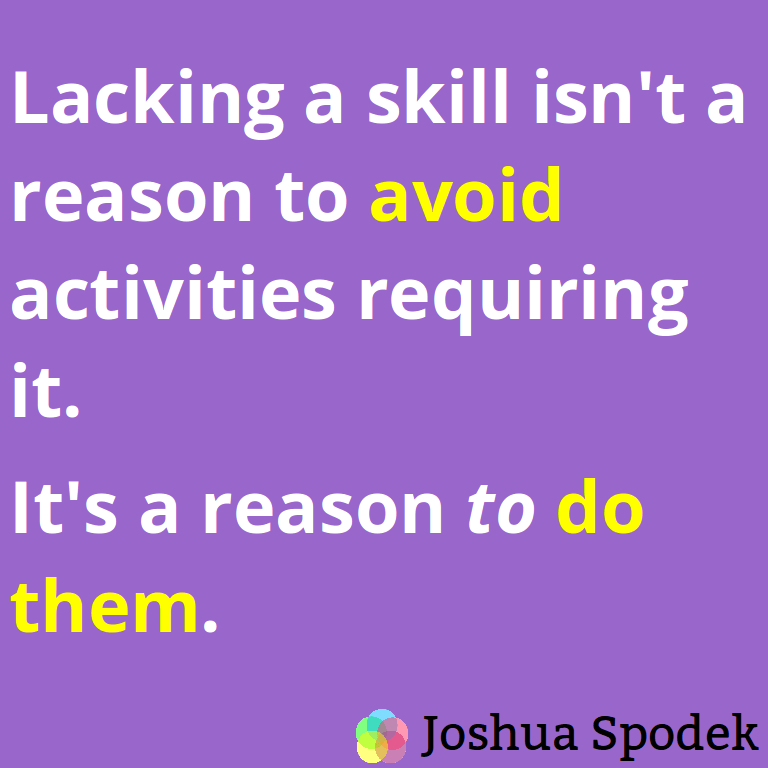 Other skills don't give so much value. Being able to cook, for example, is nice, but compared to discipline, it has limited applicability in the rest of life. Same with most skills. Discipline, on the other hand, enables you to develop other skills, which take time and resources to develop, which usually requires... discipline. I'll grant people that I probably now have a lot more discipline than the average person now. The same way someone who practices piano every day will have more piano playing skills than the average person. Do you want to play piano? Everyone knows: practice, practice, practice. Do you want to improve your life? For some reason, people think: "learn this one quick trick that Bill Gates, Oprah Winfrey, or whoever does." Or: "You have to be born with it." It pains me to hear people think such things. They seem either gullible to be sold on dreams they know won't work or they want to excuse their mediocrity by saying others had secret advantages. Nobody looks at a pianist at Carnegie Hall and thinks they did a quick trick to get there. We know he or she practiced, probably more than almost anyone. Quick tricks will get you to play chopsticks and other cute, entertaining dead-ends. Want to improve your life? Now you know: practice, practice, practice. You don't have to do burpees, but you have to do something. The key word being do--not think about, not plan, not analyze. Do. I used to think these properties added convenience or saved me money. Those are nice to have. The real value to me is that they remove excuses. I can't stop myself because it's raining, I haven't paid gym dues, or anything else. Here's why I associate burpees with the opposite of hard work: the more effective an exercise, the less you have to do it to reach your fitness standards. I want a certain level of fitness. Daily burpees help me reach it with less time, effort, cost, or anything else. The challenge to fitness isn't calories burned, distance traveled, flexibility achieved, or weight lifted. Those things measure your results. The challenge is choosing to start exercising--at least for a lazy person like me whose mind will come up with any excuse not to start and whose body will follow. Once I start exercising, I'll continue. The challenge is starting--shifting my mind from conserving energy to burning it. The physical work that burns the calories is like nothing compared to the mental work to start. Daily means I don't have to wonder if I will start. I don't need an app. I don't need a friend to help motivate me. All I can do, no matter how lazy, tired, sick, etc, is start. The discipline by doing burpees, I can apply everywhere in life, which I do, thanks to the daily routine, which bypasses my laziness and excuses. I recommend finding a self-imposed daily challenging healthy activity for yourself.